The Saurashtra Cricket Association stadium, also known as the Khandheri Cricket Stadium, is approximately 15 kilometres outside Rajkot. Radio cabs don't ply here, it is a territory marked "out of city limits". 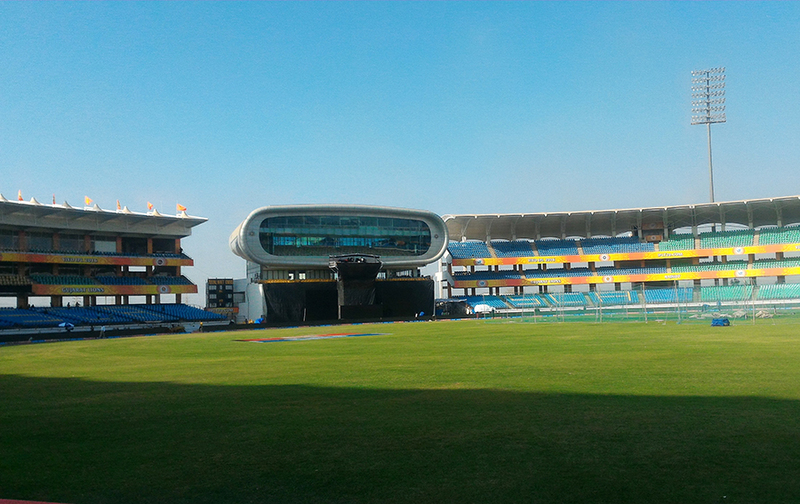 Once you hit the Jamnagar-Rajkot highway to get to the stadium, it feels like a different place. The narrow streets and lazy traffic are replaced by an endless blur of barren land that sprawls out on one side. On the highway, a signpost points to a diversion that can take you to Porbandar, the birthplace of Mohandas Karamchand Gandhi. Further down, to the right, stands a stately yet sober structure with a sign that says: "Saurashtra Cricket Stadium - Eco Friendly Stadium." There is graffiti of the Gujarat Lions' 'roaring lion' insignia as you enter the stadium premises, and, inside, a razzle-dazzle of colours. The turquoise seats, freshened with a coat of paint, are contrasted by the bright yellow and orange of the Lions signage that runs horizontally, separating one tier from another. Then there is the famous media capsule modelled on the one at Lord's and the small canopies over the stands which resemble those at the Adelaide Oval. The security personnel, like in many smaller centres, are far less officious; it is easier to take in the contemporary charms of the ground without being shooed away. Niranjan Shah, veteran administrator and SCA president, is a busy man. One moment he is having a word with curator Dhiraj Parsana and the next, he is chatting with Lions captain Suresh Raina. Shah is confident that he and his colleagues have got the arrangements down pat. He says the stadium can hold 28,000-29,000 people, and most tickets have been sold out. "There is a lot of enthusiasm here given that people have never experienced IPL at stadiums before," Shah tells ESPNcricinfo. "People from in and around Saurashtra - from places like Jamnagar, Bhavnagar and Junagadh - are expected to come in large numbers. IPL is a big hype. It has never happened here - such entertainment, cheerleaders, music - so I think people have something new." The black soil-rich pitch that will be used for the game is bald near the edges but has a thick mat of green running along the centre. It is, however, a given that the grass will be shaved off on the morning of the game. With the open spaces between the stands facilitating abundant breeze, the swing bowlers might be in play, at least for a short period. An SCA administrator jokes that there is no need of a pitch report at this venue. "Seedhi baat hai, 200-220 pitch hai [It's a no brainer that this is a 200-220 surface]." Although the stadium has hosted two ODIs and a T20 international - the most recent was the one-dayer against South Africa in October last year - Shah feels the IPL is a different beast altogether. "This is different because there are five matches. I think after the first match we will settle down," he says. "And, whatever be our shortcomings, we will rectify. [Our biggest challenge is to] conduct all five matches successfully and come out as the best stadium and get Rs 50 lakh [the prize money awarded for the best venue in the IPL]," he adds with a laugh. While there might not be a conspicuous buzz in the city, there are enough reminders of the tournament having made its way here, with billboards at some of the bigger junctions in the city and, understandably, an attempt to play up the Ravindra Jadeja factor. Jadeja, after all, hails from this part of the state and plays domestic cricket for Saurashtra. 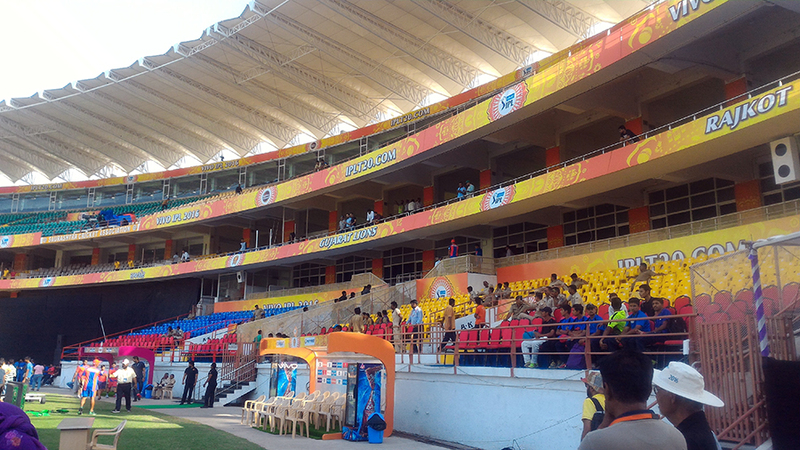 Inside the stadium there is a tall cut-out of Jadeja that screams: "Rockstar." Raina believes the match will be memorable for the entire team, not just Jadeja. "It's (a special occasion) for everyone. Gujarat never had an IPL team in the first eight years. We are looking forward to play for Gujarat," he says. "Jadeja must be excited to play in front of a lot of crowd, also, after a few days, he is getting married." The DJs at the stadium have so far had their dry runs with Lean on, by Major Lazer and DJ Snake*, and Dwayne Bravo's Champion, but Raina and bowling coach Heath Streak gave them a hint about what the team might like listening to. "We listen to a lot of Gujarati songs in the dressing room these days," Raina says with a smile before Streak joined in: "[we listen to] Game Maari Chhe [the team anthem which means "it's our game"]. *GMT 0900 The article had earlier referred to Taylor Swift as the artiste behind Lean on. The error has been corrected.